There is a growing body of evidence, clinical and anecdotal, suggesting that cannabidiol (CBD) has the potential to alleviate some symptoms of menopause. Let's explore the ways in which CBD impacts the body and mind of menopausal women. The symptoms of menopause are usually difficult to treat. The current pharmaceutical treatment options such as hormone replacement therapy (HRT) have considerable risks and are not effective in the long-term. Here is a look at the reasons why CBD may be a great option for relieving menopause symptoms. At some point in their life, women will go through menopause. Menopause occurs when a woman no longer has a menstrual cycle. This experience results from the genetically programmed loss of follicles (structures that contain eggs) in the ovaries. The condition may also occur when the ovaries are removed surgically. In either case, the cessation of menstrual periods indicates oestrogen hormone deficiency. Menopause does not occur suddenly. There is a phase called perimenopause that often begins a few years before the final menstrual cycle. The average age of menopausal women today is about 51 years. However, it can occur as early as 40 to as late as the early 60s. Early menopause tends to occur in women who have never had children or those who smoke. Menopause is not a disease, but has a range of symptoms. These include hot flashes, night sweats, palpitations, difficulty sleeping, mood changes, vaginal dryness, forgetfulness, decreased sexual drive and function, urine leakage, and joint problems. Since the life expectancy of women today is over 80 years, most can expect to live around 30 to 40 years of their lives in the postmenopausal state. The symptoms of menopause can affect women for a significant amount of time. The beneficial aspects of CBD in regards to menopause should come as great news to women around the world. There is extensive research on the complex role of the endocannabinoid system (ECS) in female fertility, including the onset of menopause. Current research indicates that some fundamental changes occur in the ECS and related biological systems during the menopausal transition. The ECS is a biological network of endocannabinoids and cannabinoid receptor proteins found in the central and peripheral nervous systems of mammals. This means that the network permeates the entire body and regulates a number of physiological and cognitive processes, including fertility. The ECS controls the interaction of cannabinoids such as CBD with the body. Oestrogen is one of the hormones that facilitates proper ECS function. It achieves this by regulating fatty acid amide hydrolase (FAAH) levels in the blood. FAAH levels fall when oestrogen production declines. During ovulation, oestrogen and endocannabinoid levels peak. FAAH facilitates the breakdown of the endocannabinoid anandamide. Anandamide has an ovarian function whereby it helps in the maturation and release of the egg during ovulation. Another role of oestrogen is activating the ECS for the regulation of emotional response. These declining interactions between the ECS and oestrogen indicate that the symptoms of menopause may arise from reduced endocannabinoid activity. HOW CAN CBD HELP MENOPAUSAL WOMEN? It appears that menopause disrupts the endocannabinoid system in women. 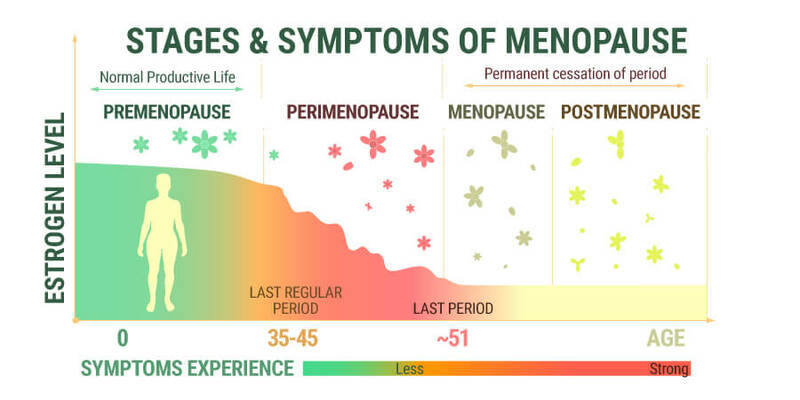 For this reason, CBD can be beneficial in managing some of the symptoms of menopause, as detailed below. Loss of bone density can occur in many women during menopause. If left untreated, this can lead to osteoporosis and other debilitating bone ailments. Oestrogen is responsible for regulating the process that replaces old bone cells with new cells. A decline in oestrogen levels results in the bones becoming gradually weaker. Osteoclasts are the special cells involved in breaking down bones. Bone loss occurs when osteoclast activity is aggressive. Osteoclasts have numerous GPR55 receptors. If these receptors stimulate the cells too much, excessive bone loss can occur, leading to osteoporosis. Research indicates that CBD can interact with GPR55 receptors and inhibit their action, thus preventing bone density loss. This is among the most common symptoms of menopause. Women experience hot flashes as an intense buildup in body heat, starting in the chest and face, followed by sweating and chills. Some women report anxiety as the sensation builds. The aforementioned anandamide, an endocannabinoid, helps in the regulation of body temperature. CBD is thought to increase the levels of anandamide in the body by inhibiting the action of FAAH. The overall effect is an improved ability to control body temperature. Insomnia in menopausal women occurs as a result of the other symptoms such as migraines, hot flashes, and joint stiffness. If left untreated, lack of proper sleep often affects other areas of a woman’s life. This may worsen the symptoms of menopause and lead to mood swings. CBD has been documented as being a very effective natural alternative to treating sleep problems. CBD has anxiolytic (anxiety-inhibiting) and relaxing effects that can help support deeper, more restful sleep. The hormonal changes that occur during menopause can result in several painful conditions. These include joint stiffness, migraines, and muscle aches. CBD can be a very effective pain-relief agent. Many people currently use CBD for pain management in clinical settings. Researchers have documented the beneficial aspects of CBD on muscle and joint pain. CBD inhibits certain cellular processes that can cause both swelling and pain. CBD’s anti-inflammatory action can help menopausal women engage in their daily activities more productively. Mood swings during menopause are the result of oestrogen and progesterone fluctuations. The mood swings are often accompanied with anxiety. In fact, menopause and anxiety go hand-in-hand. The stressful life changes that happen around this time can be the source of this anxiety. CBD has the ability to inhibit anxiety and improve mood. Extensive human and animal studies have demonstrated the anxiolytic effects of CBD. This cannabinoid is being invoked for a number of mood disorders including anxiety and depressive disorders. The body of research on the role CBD has to play in the treatment of menopause symptoms, overall, shows great promise for the cannabinoid as a natural alternative. Although further research will support these findings in greater detail, the future seems bright for CBD and the management of menopause.